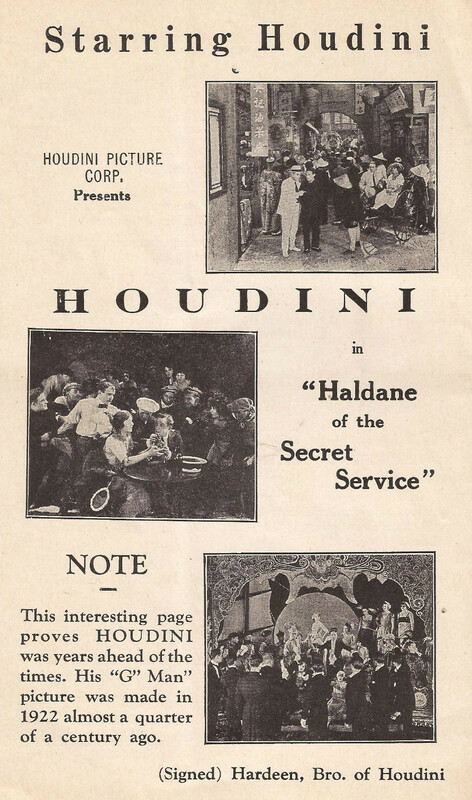 Today marks the 95th anniversary of the release of Houdini's final feature film, Haldane of the Secret Service. 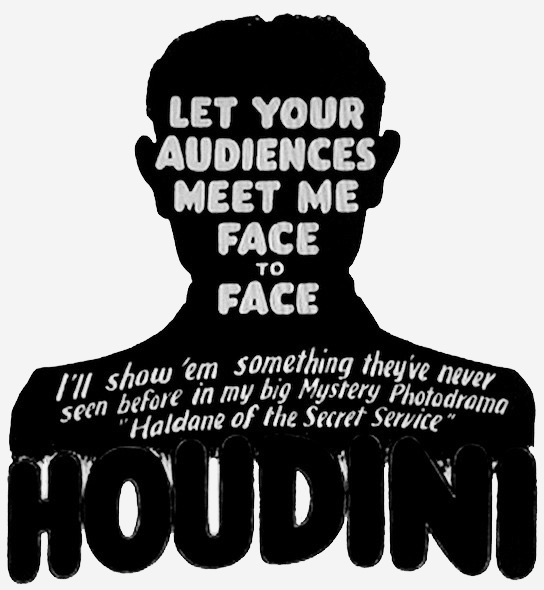 Even though Houdini had shot the movie immediately after The Man From Beyond in 1921 (and location footage in 1920), he held it back as the planned second release for his Houdini Picture Corporation. But instead of self distributing via States Rights, as he had done for Beyond, Houdini turned to FBO (Film Booking Office) to release the movie. They did so on September 30, 1923. 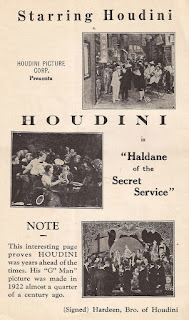 By the time Haldane was released, Houdini was deep into his new role as a debunker of fraudulent spirit mediums, and was touring the country with his spirit lecture. Therefore, his support of the movie was not what it had been for his previous films. He did find time to make a personal appearance at the Crescent Theater in Austin during the movie's run there in November. But by in large, it's clear that Houdini had moved on from movies and was now among the spirits. 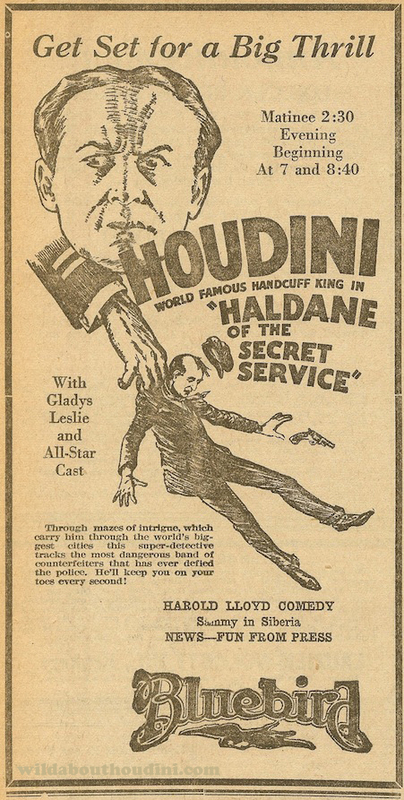 For many years, Haldane of the Secret Service was dismissed as Houdini's worst movie; a clumsy mis-mash of plot baked with random footage from his 1920 European tour. But I actually find it on par with The Man From Beyond, and maybe even the superior film. Of course, I don't dislike any of Houdini's movies, but I do find his two HPC productions the weakest of his filmography. The Man From Beyond remains fascinating as it's Houdini's most personal film and offers a glimpse into his mindset at the time, such as his fascination with reincarnation and early endorsement of Sir Arthur Conan Doyle. But it's a pretty turgid slog until the climax on Niagara Falls, which largely redeems the film. Haldane, in contrast, is a sprightly detective thriller (once we get past the overlong bag-swapping opening). And far from being a liability, the 1920 location footage is fantastic, capturing those famous city streets at the time, and it's fun to see Houdini set against historic landmarks like Big Ben, the Eiffel Tower, and the Statue of Liberty. Houdini being dragged by an ocean liner is wild stuff (the publicity claimed this was all real, and it certainly appears so). 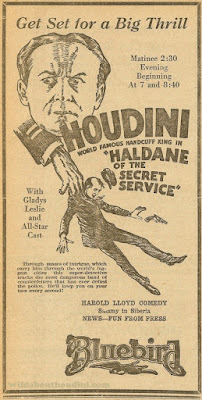 It's also cool to see Houdini dressed in a cape and top hat during the London club sequence; the classic image of a magician which he never assumed during his magic career. The lively Gladys Leslie is an experienced silent movie actress and a big improvement over the casting of novice Jane Connolly in Beyond. And the water wheel stunt at the end is as spectacular as any escape in any Houdini movie. One might even argue that Haldane showed Houdini's HPC movies were improving, although maybe too slowly to salvage his movie career. Sure, the plot is a bit overwrought (with some offensive stereotypes), but not any more so than The Master Mystery, which Haldane reminds me of a great deal. It's almost as if we are seeing the continuing adventures of Quentin Locke. But, come on, we're not watching these movies for the plots. 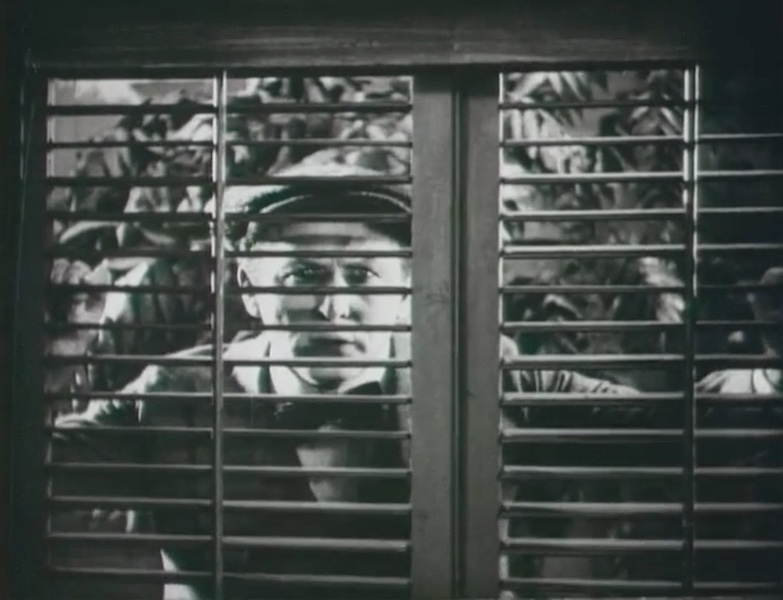 We're watching them to see Houdini in action, and Haldane gives us some great and varied Harry with lots of nice closeups and moments to savor. Being a James Bond fan, I'm always struck by how Haldane anticipates the basic structure of the spy film genre. After setting up the action in New York, the hero globe trots to various thrilling cities, evading death traps by henchmen who work under the command of a mysterious supervillain (Dr. Yu = Dr. No). And it all ends with a set-piece finale in a monastery that the villain uses as a lair (as does the 1981 Bond film For You Eyes Only). In his pitchbook biography, Houdini His Life and Work in Prose and Picture (left), Hardeen makes a similar claim the Haldane anticipated the popular "G-man" movies of the '30s. The reason I think Haldane of the Secret Service was so maligned for so long was because so few people had actually seen it. Haldane was as lost to the world as The Grim Game. (My understanding was a collector held what was thought to be the only copy on VHS, and would rent it at an exorbitant fee.) So most biographers simply accepted the verdict of the Variety review at the time (which was not kind) and equated Haldane's box-office failure with creative failure and moved on. But in 2007, a print screened at The Silent Movie Theater in Los Angeles, which often ran The Man From Beyond. That print found its way onto DVD and eventually to streaming, so these days a fresh assessment can be made of the movie along with Houdini's filmography as a whole. As for today's anniversary, I've never been able to find a premiere, or a clear first showing of Haldane. The release date of September 30 comes from the excellent film notes by Bret Wood on the Kino DVD set. IMDb also uses this date. I have found an opening day ad for September 29 at the Unique Theater in El Paso, so it might have slipped out a little early in some territories. But I think it's safe to use September 30, 1923 as the day Haldane was officially released to the world. So on this 95th anniversary, here's a shoutout to Houdini's last and most under-appreciated movie. "The name's Haldane. Heath Haldane." Well, I look forward to watching this film now! Glad it could be released, at last. We actually like Haldane very much. In many ways it was a move forward, as the plot was clear, the movie moved forward in a concise manner, not rambling as some of his earlier movies. It was on par with earlier films and in some ways a better film. The Man From Beyond remains interesting as it “shows” Houdini's possible belief in life after death at that time or his consideration of the possibility of reincarnation. He seemed to struggle through his life with thoughts of what the hereafter would bring, or if it existed at all. He would later seem to turn more skeptical with his looking to sponsor or co write a book with the working title “The Cancer of Superstition” which lined up with his anger against the frauds who were cheating people via the “religion” of spiritualism, who he took on in his final years. Houdini moved on, having decided there was no money for him in the movie industry or it was too hard to battle the powers that be in Hollywood. The climax of The Man From Beyond in Niagara Falls, which for its time was quite innovative and exciting brings the movie to a thrilling conclusion, as did the plane crash in the Grim Game. For decades the plane crash scene was the only part of The Grim Game that was thought to exist. We were repsponsible for uncovering the film having seen it through our friendship with collector Larry Weeks, resurrected it and had it restored with the help of Turner Classic Movies, who promised to show it on their stations worldwide, which they did. Of course it remains his best film by far, and dispels the once fashionable idea put forward, we feel, in many ways by jealous magicians, that he was a bad actor. Haldane is a detective thriller. The location footage is fantastic, as you point out, capturing those famous city streets at the time. The footage of him with Big Ben, the Eiffel Tower, and the Statue of Liberty, does as you say give it a James Bond feeling. The water wheel stunt at the end is as as good as it gets. As Hardeen claimed Haldane anticipated the popular "G-man" movies of the '30s. As you point out it also anticipated the basic structure of the spy film genre, including James Bond. One of the best places to see Houdini’s movies and newsreel clips, except for The Grim Game, is the now out of print Kino DVD set. We, as you may recall, advised readers here to get the set before it ran out, and has now more than doubled in price on eBay and Amazon in the range of $100 to $399. Worth it even at those prices.